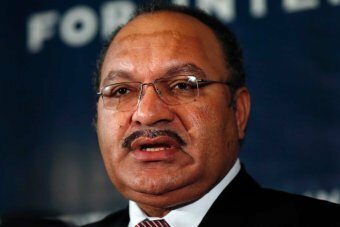 Peter O’Neill, the Prime Minister of Papua New Guinea, has called on the Indonesian President Joko Widodo to reduce the number of military troops in West Papua in accordance with a pledge made by the former President of Indonesia. Although Mr O’Neill had stated that his Government intends to foster a friendly relationship with Indonesia, he reiterated the importance of speaking out about the abuses taking place in West Papua. Mr O’Neill also referred to West Papuans as “our people” or “fellow Papuans” in a bid to promote the right of West Papuans to greater autonomy. Mr O'Neill told Radio Australia's Pacific Beat program that Mr Yudhoyono had discussed this intention with him during a bilateral meeting when the PNG prime minister was in Indonesia for a state visit. He said he hoped current president Joko Widodo would keep the former leader's promise. "We will try and hold the Indonesian government to that, to make sure that the current government also has the same view about a reduction of presence of military on the island, and of course more autonomy for the people of West Papua," Mr O'Neill said. He said there were no specific details discussed at the meeting with Mr Yudhoyono on the number of troops to be withdrawn. Mr O'Neill said he wanted to take a diplomatic approach to the issue of the future of West Papua, the mainly Melanesian and Christian western half of New Guinea Island. "We all need to have a very cordial relationship with Indonesia and we will continue to maintain that," he said. "But that does not mean we will not keep quiet about the abuses that are taking place. "I'm certain that Indonesia as a member of the international community will do the right thing, they've committed to us." Dr Richard Chauvel from the University of Melbourne's Asia Institute said he had never heard such forceful language from a PNG leader when talking about the Indonesian province. "Peter O'Neill's directness of laying the responsibility on the Joko Widodo government to fulfil Susilo Bambang Yudhoyono commitments ... The frankness of that was remarkable," he said. "The language he has used in terms of identifying West Papuans as 'our people', the other side of the border as 'our fellow Papuans', I think that is a remarkable change from the statements of any of his predecessors." The West Papua expert also said Mr O'Neill's statement had the potential to embarrass the Indonesian government. "But he was also very cautious in the way that he linked the statement to the more effective implementation of autonomy for West Papua and also Indonesia's responsibility as a member of the international community," he said. Mr Chauvel said Indonesia's version of the meeting with Mr O'Neill, however, was "starkly different". Mr O'Neill's comments come after West Papuan independence leader Benny Wenda was refused entry into PNG yesterday, after he arrived without a visa. He said the reason Mr Wenda was not allowed to enter the country was a simple immigration matter and not a political issue. "We welcome anybody to come to the country, but we must follow the immigration laws," he said. "There are no exceptions for anyone." Mr O'Neill was in Melbourne on Thursday among the mourners at the funeral of former Australian Prime Minister Malcolm Fraser. He said Mr Fraser gave strong support to PNG's push for independence, which was granted in 1975 when he was opposition leader. "In the early years his support for Papua New Guinea was well regarded and well appreciated by our country, that is why I am here today to pay our respects to him and to the family," he said.